When you want the latest information on insurance fraud and other scams, Anti-Fraud News is the website to check out on a regular basis. We want to inform you about all the latest scams and tactics that have been designed to con you and steal your money. Insurance fraud is what happens when an act is committed with the intention to fraudulently obtain some benefit that the scammer would not otherwise be entitled to. These type of false insurance claims are made with the intention to defraud an insurance provider, and there are diverse claims ranging from faking one’s own death, exaggerated claims or injuries, stolen items, and auto insurance claims. There is even a very high profile case of insurance fraud currently in the media, involving an ex-NFL athlete, who has, along with his alleged partners, been charged with conspiracy to commit mail and wire insurance fraud. This insurance scam reportedly used fake information in order to trick consumers into a life insurance scam that brought in more than $50 million. 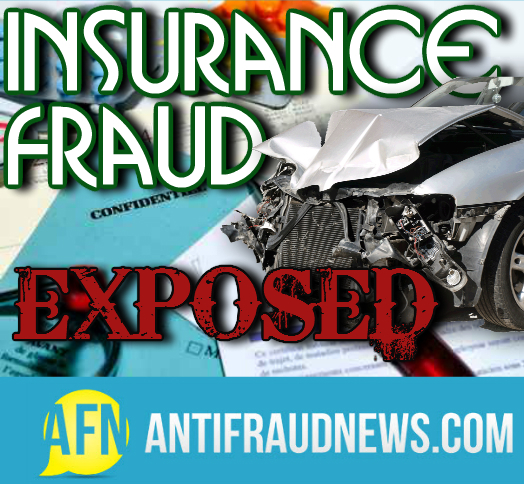 The cases of auto insurance fraud have risen in recent years, ranging from people crafting fake titles for expensive cars and reporting the non-existing vehicles missing, all the way to people braking hard in front of a car, hoping to get hit and claim a non-existing injury. However, insurers are working hard to spot insurance fraud and those who are caught submitting false claims could be facing high fines and jail time. One way that insurance fraud can be spotted is if someone has a history of making multiple insurance claims. Insurers are also trained to spot suspicious behavior, such as a person acting completely calmly when submitting a large claim or adjusting home or auto insurance policies shortly before filing a claim. Insurance companies hire employees to investigate claims, such as making sure that alleged injuries match supposed accidents. Another way that insurance companies are catching those committing insurance fraud is via social media. Luckily, sometimes those who tend to file false claims, also tend to brag about such actions via Twitter or Facebook. While you may think that someone claiming a leg injury probably wouldn’t post pictures of themselves at a dance class online, but you would be surprised! Insurance fraud results in higher premium costs for people like you. With insurance fraud on the rise, it will continue to cost billions of dollars a year. Insurance companies are working to prevent insurance fraud and it is wise to report any false insurance claims you might know of, as insurance fraud costs us all in the long run.